Apples and pears are members of Rosaceae family and are believed to originate in Asia. Both fruits have white flesh and are covered with skin. They have a core containing seeds. "An apple a day keeps the doctor away" says famous English expression. Is it really true? And what’s about a pear? Doesn’t it keep the doctor away? In order to find out the answers, let’s conduct a comparative analysis of their nutrition features and health impact. Before passing to the next question I would like to dwell on the nutritional content comparison, which is the key point for the further discussions. 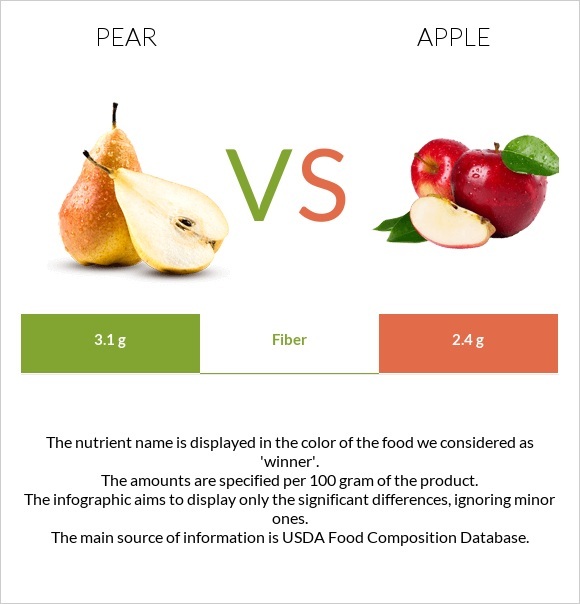 As you can see from the charts of comparison below, apple and pear are equal in Potassium, Phosphorus and Sodium, but pear contains more Iron, Calcium, Magnesium, and, especially Copper and Zinc. So the winner is pear. What about vitamins? There is no drastic difference either, but, anyway, apple wins here, it’s higher in Vitamin A, Vitamin E, Vitamin B1, while pear is higher in Vitamin B3 and Vitamin K. They are equal in Vitamin C and Vitamin B2. Apples and pears are the perfect products in case of diets. Although they are rich in sugar like all fruits, the glycemic index is low. They are rich in fiber and antioxidant content, low in calories as you can see below, but anyway pear is the champion here with higher fiber and lower sugars. In spite of the fact that there are fewer studies about health benefits of pears and their components, than about apples and their components; let’s run a little comparison of their health impact. Apples are rich source of phytochemicals, including flavonoids, carotenoids and phenolics, which may help to reduce the risk of different diseases by various mechanisms, like a cell signaling, antioxidant and cancer cell antiproliferative effects. These effects decrease the risk of cancer, cardiovascular disease, asthma, Alzheimer’s disease. According to the review (1) which involves several reports prior to May 2004, apple consumption is particularly associated with reduced risk of lung cancer. According to another review (2) published in September 2011 significant risk reduction associated with apple intake was observed in cancer at several sites, including oral cavity and pharynx (18%), esophagus (22%), colorectal (30%), larynx 41%, breast (24%), ovary (24%), prostate (7%). High content of soluble fiber of apples and pears reduces the levels of low density lipoprotein or “bad cholesterol” and total cholesterol in plasma according to the study published in January 2012(3). Apples contain flavonoid epicatechin which may lower blood pressure. On the other hand, pears contain quercetin, which not only reduces blood pressure, but also has anticancer properties. The next worth mentioning point is the role of pear and apple intake in reduction of risk of type 2 diabetes mellitus. According to the review published in January 2017 (4) consumption of apples and pears was associated with 18% reduction of type 2 diabetes risk. It is ensured through an antioxidant and fiber contents of these fruits. According to the review (5) published in 2015 due to their fiber content pears may improve gut health and prevent constipation. Except for benefits, apples and pears may have some risks for health. They contain huge amount of fructose compared with glucose, and over-consumption may intensify pain, bloating, gas and diarrhea in people with irritable bowel disorders. Besides, apple seed contains powerful poison cyanide, so overeating of apple seeds could be fatal. In addition, apples are quite acidic which makes them up to four times more harmful to teeth than soda. Pear originated in China in the foothills of the Tian Shan Mountains approximately 5000B.C. In the Odyssey Greek poet Homer refers pears as “a gift of gods”. The Chinese considered a pear as a symbol of immortality. Pear leaves had been smoked before tobacco became popular in Europe. Pear was sacred to several goddesses – Hera and Aphrodite in Greek mythology, Roma goddesses Juno and Venus, as well as to Pomona- the Roman goddess of fruitfulness. In ancient Greece pears were used against nausea as a natural remedy (6). And what’s about apples? Apples originated in the Middle East more than 4000 years ago. Homer mentions about apple trees too in Odysseys. The Norse gods connect their immortality to apples. Apples also are mentioned in Arabian Nights. Apple is popularly known as a forbidden fruit of Eden. But actually there is not any notice about forbidden apple in the Bible. Storage life of apples and pears depends on harvesting at the proper stage of maturity and proper storage. Apples have several indicators of maturity, they are juicy, crisp, firm, well-colored and have characteristic flavor. Apples, harvested too early, are poorly flavored, sour, astringent, and starchy. On the other hand, fruits harvested too late are mushy and soft. The fundamental determinant criteria for maximum storage life are the temperature and relative humidity. At a temperature about 32?F and a relative humidity between 90 and 95 percent apples could be stored up to 3 to 5 months. At the same time it isn’t preferably for pears to ripen on the tree, because they become gritty and poorly favored due to developing of stone cells in the fruit. Pears should be harvested when their color changes from a deep green to a light green and should be ripened indoors at a temperature of 60 to 70°F. In order to store pears for approximately 1 to 3 months it is necessary to preserve non-ripened fruit at a temperature of 30 to 32?F and a relative humidity of 90 percent. Furthermore, there is a specific method for more long-term storage of apples and pears called controlled atmosphere storage. It helps to slow down the ripening and aging processes of stored fruits. The principle of this method is based on reducing the temperature to the lowest level possible without damaging the fruit by freezing, changing the atmosphere in a storing room by reducing the oxygen and increasing the carbon dioxide. It seems essential to emphasize that daily consumption of apples and pears is highly recommended for plenty of reasons. Due to their almost similar nutrient content both of them are considered to be useful in protecting against many serious diseases. Despite the conventional wisdom that apple contains a huge amount of Iron, we discovered that pear contains more. On the other hand, apple is richer in vitamins and antioxidants, which protect against cell proliferative and oxidative processes. And, however valuable they may be, it is crutial not to forget about the sense of proportion – every drug could be a poison.